Johann C. Geiss (1771-1846) was an innovator in the field of iron jewelry. Geiss designed jewelry elements that could be individually sent out for casting then assembled at his workshop. Eventually, he opened his own foundry in Berlin. His popular necklaces and bracelets included iron motifs set in gold and silver. He was one of the few to create Berlin iron jewelry and sign it. 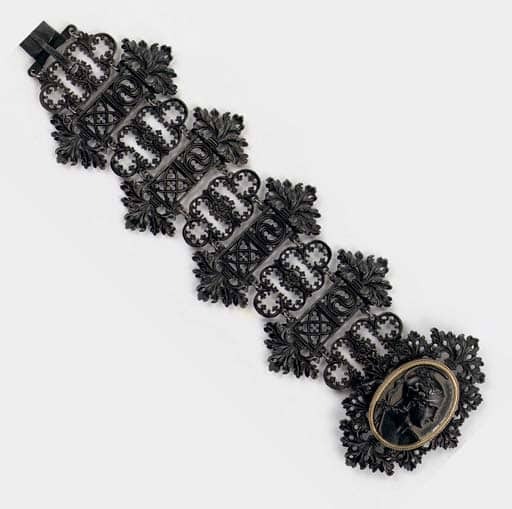 Geiss Ironworks Acanthus Leaf Motif Gothic Revival Bracelet. Signed Geiss a Berlin. Photo Courtesy of Christie’s.